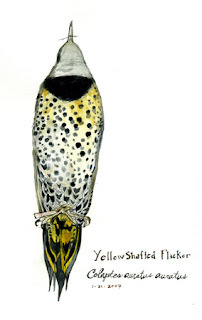 Flickers are large-ish woodpeckers and like most other woodpeckers they have zygodactyl feet: two toes toward the front and two in the rear, giving the foot an "X" appearance. They also have fairly strong rectrices (tail feathers) that assist in supporting the bird while clinging to the sides of trees. Northern Flickers have a number of different morphs. The Eastern, which is what I prepared and what you would see around Chicagoland, is often referred to as Yellow Shafted. One can see why by looking at the tail feathers and the inner parts of the wings. Out West, it's the Red Shafted and there is a cross over area where there is evidence of interbreeding between the two. I was a little in awe of the spotted pattern on the breast.